Bring her home and let her die in peace and with dignity. Part 3: Praise God. She did not die!! Part 1: The mantra of NO CURE BUT THERE ARE TREATMENTS is meaningless. Part 2: Come back and see me again after a week! Six days after taking papaya leaf juice and our herbs (without anymore chemo and antibiotics), GM is still alive. She did not die, instead she had improved! Unfortunately she is still unable to walk. GM was carried into our centre by her husband. When settled on a chair, GM looked normal (watch the video below carefully). I asked her: Do you still want to die? She answered: No, no, no. I now want to live. Let us find out why GM wanted to die when she was under treatment in the hospital. Besides having to endure the severe side effects of chemo and radiation, she developed stubborn high fever. Before the onset of her fever GM felt very cold and trembled. This lasted for about an hour. Then her fever starts. The temperature could go up to 41.2 C. She felt hot outside but cold inside. The high temperature could last 2 to 3 hours. So GM was miserable 3 to 4 hours during each fever attack. And she had to endure 3 to 4 attacks a day, even at night. It was when the temperature shot up to 41 C that GM felt she wanted to die – this happened twice. From the doctor’s report, GM first started to develop stubborn fever 4 days after her first chemo-treatment in late April 2016. Even rounds and rounds of antibiotics, the fever refused to go away. This means that GM has been going through “hell” for many months already. The family decided to stop all medical treatment and brought GM home. So no more antibiotics and chemo! 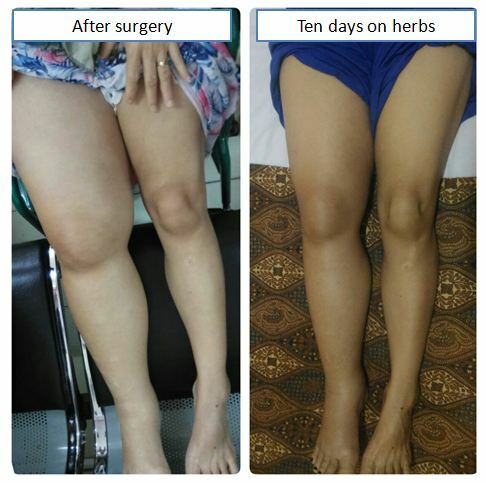 She was started on CA Care herbs and in addition took young papaya leaf juice twice a day. Miracle happened! Her health improved. The stubborn fever subsided and she had low grade fever once a day (instead of high fever 3 to 4 times). Even when there was a fever attack, she did not feel cold anymore. She did not tremble anymore. The highest fever recorded was 39 C, otherwise, her body temperature stayed around 37 C and 38 C.
Update: A few days later, we got a message from GM’s sister saying that GM did not have any more fever! Another battle won! Now, there is one more immediate problem left to be solved — how to make GM regain her strength and start walking again. The doctor wrote: The patient is bed-bound. We wanted to know the story behind this sad development. GM’s sister wrote to explain what actually happened. When she was diagnosed with cancer, she still could walk very well like normal people. After her 1st chemo she was still able to walk well. After the 2nd chemo , she felt the right leg was a bit “sour” but she was still able to walk. Same happen after the 3rd chemo, right leg felt “sour” but still could walk. She started radiotherapy on27 June 2016. On 1 July 2016, her leg felt weak and she could not walk so well. And this symptom persisted but the doctor just told us it was because of low salt inside body. This can make people tired and has weak leg. At that time, she already could not walk by herself. My sister started to sleep for about 20 hours per a day on 5 July 2016. We thought she was tired because of the radiotherapy. However, when we went back for the 9th session of radiotherapy on 8 July 2016, her oxygen level dropped and doctor said she could not continue with the radiation any more. The doctor said the tumour had already gone into the bone marrow. So, they stopped radiotherapy and start her on chemotherapy again. After that day, she could not walk anymore and had to just lie on the bed. Praise God, another battle was won. If the patient wanted to die, then there is not much we can do to help. But if a patient wants to live, there is still hope. Let’s not give up hope. With God’s blessing, we can look to a new day. GM did not have any more fever, something that the doctor was desperately trying to “fight” for months. God’s natural medicine found in papaya leaf juice make the fever disappear within a week! Goh of Sarawak. Seventy-three-year-old with colon-liver cancer. He had swollen legs and stomach, was unable to walk. Doctors on ward round skipped him, This case I don’t want to touch. No use, his liver is not functioning anymore. He was in constant, severe pain and was on morphine. They left him to die. He too wanted to die. The family brought him home, to die at home. His son started him on CA Care herbs. The other family members said, No need to give him anything — why waste money? On his birthday, they made him a coat, ready for his funeral. As Goh started to take the herbs, his swellings were gone, the pain vanished and his health was restored. He became healthier than he was before he had cancer! 2. Suri: Sixty-one year-old, diagnosed with lung cancer which later spread to her brain. She had undergone 22 x radiation, 40 cycles of chemo, 1 year on Iressa, 2 years on Tarceva, and 1 month on Sutent. The family gave up treatment and sought our help. They had spent 2 billion rupiah or SGD 300,000 and Suri ended up like a zombie – unable to walk and talk. Oblivious to her surrounding and had no facial expression. In short, she was a living dead. Two months on CA Care Therapy, she could walk, talk, smile and laugh! Some months later, she could even go shopping! 3. Medan Lady: Soon after undergoing chemotherapy in Singapore in December 2011, she ended up in a hospital in Medan. Is this the final destination after a long journey – one and half years of chemo and spending about two billion rupiahs? On 17 December 2011, all family members from various parts of Indonesia flew home to be with her. She was gasping for breath and unable to recognise people around her – her eyes rolled upwards and were not responsive. The doctor told the family members to just pray. 4. GM’s own grandmother. Many years ago, GM’s grandmother was also diagnosed with a rare, aggressive and deadly cancer. They called it anaplastic thyroid cancer. The lump in her neck was cut open and then closed. Nothing could be done. She was sent home without any treatment and given at most 6 months to live. She came to us for help and lived for some years! Can we do the same to her granddaughter? Only through God’s mercy and blessing. When GM’s sisters came to seek our help a week before, right in my heart, I thought GM was going to die. No more hope. But after seeing GM (after 6 days on herbs), right in my heart, I am full of hope that with God’s mercy and blessing GM is not going to die if she is being properly managed. Part 3: Praise God, She did not die! On the second day, the 2 sisters came again. The family was fully aware of the seriousness of the problem. The family decided to get GM out of the hospital — no more medical treatment for her. Accordingly to the sister even the oncologist agreed that GM should not get anymore chemo! So GM had no choice but to come to us for help. One sister said, Nowhere else to go. Go to any hospital, they will give her chemotherapy and radiotherapy! They wanted to try out the herbs – for better or for worse, with the understanding that GM might die anytime. (Note: This medical report is rewritten in layman’s language. The facts remain unchanged while the medical terminologies are omitted for our better understanding). Palliative radiotherapy to head and neck, 13 times (abandoned due to disease progression). Doxorubicin, Ifosfamide and Vincristine from 15 to 17 July 2016. This 33-year-old lady came to my attention on 20 April 2016 when she came for an opinion. She had left sino-nasal tumour. Presented with severe protrusion of the left eyeball, swelling of the left cheek, blurred vision and severe headache. The post-nasal biopsy on 19 April 2016 was reported as a squamous cell carcinoma. But I consulted Prof P who communicated to me that it was a NUT Midline Carcinoma. CT whole body on 25 April 2016 revealed an extensive left sino-nasal tumour with extension into the left orbit. I made it clear to her and her family that this was a stage 4 cancer and the aim of the treatment was palliative in nature. On 26 April 2016, patient had a chemo-port inserted to facilitate the administration of chemotherapy. By Day 4 of chemotherapy, her eyes started to feel better but she began to develop a fever. She was given antibiotics — Co-Amoxiclav, Ciprofloxacin and Teicoplanin. Her fever failed to settle. Suspected infection of chemo-port. This was removed. Her fever subsequently settled after removal. Patient had a very good response to chemotherapy. She received 2 further cycles of TPF chemo. After completion of the third chemo, she was planned for radiotherapy — IMRT which was to start on 27 June 2016. But she complained that her left eye was starting to swell up again in the last few days. A repeat CT was performed. Unfortunately, she had developed progressive disease within 3 weeks of her last TPF chemotherapy. Nevertheless, we started her on radiotherapy and she responded after 5 to 6 times. Left eye swelling was reduced. Patient at the same time received 1 cycles of chemo with Cisplatin on 28 June 2016. After the 8th sessions of radiotherapy she was increasingly lethargic and listless with general weakness of her peripheral limbs. Her blood test showed severely hypercalcaemic with slightly raised urea and creatinine. This was associated with daily raised body temperature and fever of 38 C.
Patient was given Zoledronic and Co-Amoxiclav. Her platelets were gradually dropping from 384 (on 4 July 2016) to 214 (on 8 July 2016) to 100 (on 11 July 2016). This was associated with a persistent fever and body pelvic pain. We felt that there were increasing bony metastases. She was having progressive systemic metastases as evidenced by the severe hypercalcaemia. We offered her second line chemotherapy using Doxorubicin, Ifosfamide and Vincristine. Patient’s radiotherapy was discontinued after 12 times. A chemo-port was again inserted on 11 July 2016 with a 3-day regime of Dox/Ifos and Vincristine. She had persistent fever even before her chemo-port insertion and her antibiotics were switched to meropenem infusion. By Day 3 of chemo, her platelets were down to 53 and her calcium levels dropped to 1.75. Despite infusion of calcium gluconate she had persistent low calcium. Her Magnesium and Phosphate levels were low. Her urine output was high. It was felt that she had developed Ifosfamide-induced Fanconi’s Syndrome causing renal tubular leakage of her electrolytes and nephrogenic diabetes insipidus. Patient also suffered transient episodes of agitation which was attributed to post-Ifosfamide Grade 1 encephalopathy (see explanation below). Her platelets which had been on a reducing trend before chemo, continued to drop during and after chemotherapy. She required daily infusion of platelets since Day 3 of chemo to prevent bleeding. Xarelto which had been her DVT was discontinued. To correct her electrolyte imbalance she was given daily infusion and oral calcium, phosphate and potassium supplementation. Desmopressin was given daily to reduce her urine output but she developed fluid retention. Her persistent high body temperature and fever continued. She was switched from Meropenem (completed one week) to Gentamicin and Ciprofloxacin. Patient was kept on regular paracetamol. Patient developed neutropenia (low white blood cell) on Day 6 after the chemo. She was given daily G-CSF and Pegylated-GCSF. Due to the persistent fever and the clinical diagnosis that she may have tumour-related fever. Her Gentamicin and Ciprofloxacin antibiotics have now been stopped after 5 days of infusion. She no longer required any platelet transfusion. Patient is mainly bed-bound but is able to mobilise with the assistance of 1 to the toilet. Her CT was repeated yesterday and shows progressive skeletal metastases. There is some mild basal atelectasis (one or more areas of the lungs collapse or don’t inflate properly) and likely reactive mild left pleural effusion (fluid in the lung). Her prognosis remains poor. Overall, her disease management has been challenging. Her disease improves dramatically but also relapses rapidly. Her chemotherapy was also complicated by the uncommon adverse effect of renal dysfuntion. Thank Sir, for your detailed 3-page-report. It was well written and well understood. You must have taken a lot of your precious time to write this. Also, we appreciate your frankness in telling us what had happened. I must admit I felt intimidated after reading your report. You tried your best and your medicine failed you. We understand that. Then as a last resort, the patient’s family came to us for help. So what help can we give her? Nothing much, the like of those expensive, potent and destructive drugs that you prescribed. What we can offer is a simple advice. We could not offer GM what the doctor did. We are not doctors! And we don’t think like doctors too. We only used our commonsense to reason things out and try to figure out why GM went into that “bottomless pit.” So this is what we said and did. Our advice: Go home and let her die in peace and without suffering. Heaven is a better place where no one suffers from any cancer. Courage is not about fighting a battle that you know you cannot win. Courage is not about fighting a battle you have to suffer before you lose. Here, radiation and chemo were given. GM suffered blood clot in her left calf. Then there was the chemo-induced Fanconi Syndrome, kidney failure and diabetes. Her platelets and blood counts were nearly wiped out by these toxic drugs. Her immune system was probably destroyed. Her body became sick with high temperature and stubborn fever which no drugs in the hospital could fix the problem. So to us, courage is about accepting reality and giving up that fight which seemed to be the cause of more problems. So to us, if this reality is accepted, we have won the first round of the battle. Four months before this disaster (in April) GM was still a “healthy” person and was able to sell curry mee in her stall. Then she had “flu-like” symptoms and took a variety of antibiotics. Within three weeks her left eye and face were swollen. Her sister said the left eye was “swollen like the eyes of gold fish”. So, common sense is needed here. How could this be? What caused the swelling? Unknown to many people antibiotics can cause havoc in some people. Paul Ruggieri, in his book Confessions of a surgeon (pg.39), wrote about one of his patient. I am sure Mrs. Grady had contracted an infection in her large intestine … she had contracted the infection from the oral antibiotics prescribed by her family physician. The antibiotics used to treat her pneumonia inadvertently wiped out some of the “good” bacteria living in her large intestine. Mrs. Grady was on this antibiotic for just 10 days. Mrs. Grady had stopped making urine and her kidneys had completely shut down. Mrs. Grady had to undergo a major surgery to remove her large intestine. In another book, Bitter Pills, Stephen Fried wrote about his wife, Diane, who was give antibiotic pill to treat her urinary infection which she didn’t know she had. Diane swallowed the first pale yellow oval tablet with breakfast. Six hours later Diana landed in the emergency room. She was disoriented and hallucinating. Her mouth was dry and she felt tingling in her left arm and hand. She was having trouble talking. When she went to lie down, she started shaking uncontrollably and then saw white. She was sure she was dying. Chemotherapy caused drastic drop in blood counts and platelets. GM’s platelets count was low yet she developed blood clot in her left calf. How could this be? From the internet we learn that, ” When you don’t have enoughplatelets in your blood, your body cannot form clots.” Otis Brawley, an oncologist, in his book How We Do Harm, wrote: Cancer patients are often given this blood boosting injections (erythropoiesis stimulating agent — ESA) after chemo causes drastic drop of blood counts. ESA are shown to increase risk of blood clot in the veins. If what Dr. Brawley wrote is true, one cannot help but ask if the ESA injections that GM received be the cause of her Deep Vein Thrombosis? Common sense also prompted us to ask — Is the cancer that aggressive? Or is it the treatments that make the cancer aggressive? The literature in the internet is replete with this kind of statement: Patients do not die of their cancer, they die of their treatments. Part 3: Praise God! GM came to see us! She is still alive! GM is a 33-year-old female. Her problems started about 3 months ago (mid April 2016), when she had a “flu.” She took some medications from the pharmacy but these did not help her. Then she went to three hospitals. Doctors prescribed antibiotics. These did not help her either. 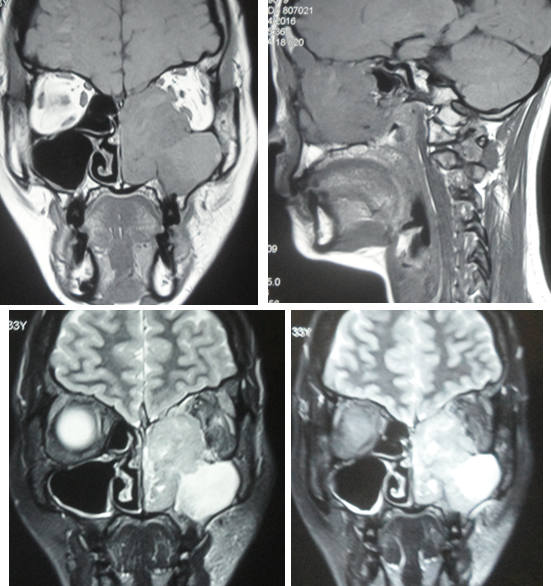 Then a CT scan on 15 April 2016 indicated a left sinonasal polyposis (presence of multiple benign polyps in the nasal cavity and paranasal sinuses. It causes a particular pattern of chronic sinusitis). Since the antibiotics did not help, there was nothing much the doctors in her home state could do. Lobulated irregularly enhancing soft tissue involving the left frontal, left maxillary, left ethmoidal sinuses, nasal cleft, etc. Bony breech of the anterior aspect of the left ethmoidal/orbital bone with tumour extending anterior to the subcutaneous tissues. Enlarged both submandibular and left cervical lymph nodes. Enhancing foci in the right body and both rami of the mandible bone suspicious of metastatic deposits. Fluid filled left frontal and left maxillary sinuses. Mucosal thickening in the left sphenoidal sinus. Impression: Features are suggestive of left sino-nasal carcinoma with diffuse local infiltration. It was suggested that GM suffered from a rare, aggressive and “almost uniformly fatal” cancer known as NUT Midline carcinoma. From the onset the family was told that there would be NO cure, but the disease can be treated! From end of April to 1 August 2016, GM underwent chemotherapy and radiotherapy. In addition she received a variety of antibiotics and medications (details, Part 2 of this story). It was a losing battle all the way. In all, the family spent RM 100,000 for the treatment until “everyone” gave up. It was at this point that GM’s two sister came to seek our help. On the first day of the sisters’ visit to us, we did not prescribe any herb. We only asked that the family had a discussion first. For us, this is a gone case. In fact even the oncologist told the sisters that he preferred not to offer any more chemotherapy. Nothing that were done worked! So the notion of there is NO CURE BUT THERE ARE TREATMENTS for the disease turned out to be a cruel joke. GM suffered badly — from the treatments? From the cancer? In fact GM had twice told her father that she wanted to die and the family should not worry anymore about her. She knew her time is up. Our advice to the 2 sisters on their first visit was: Bring her home and let her die in peace and with dignity. Listen to our conservation below.